Outdoor lighting can be a great addition to your home. It can be beautiful, functional, and enhance security. There are many options when it comes to outdoor lighting. How you choose to use outdoor lighting really depends on your needs and goals. But many homeowners are left wondering where to start with outdoor lighting. The pros at Night Vision Outdoor Lighting have some tips that should help get you started. So go ahead and have fun with your new outdoor lighting! The first decision you will need to make about your outdoor lighting is what kind of lighting you want. One reason is simply for its aesthetic benefits. If you’ve spent time, energy, and money on a beautiful home and garden, you want to keep showing it off at night. 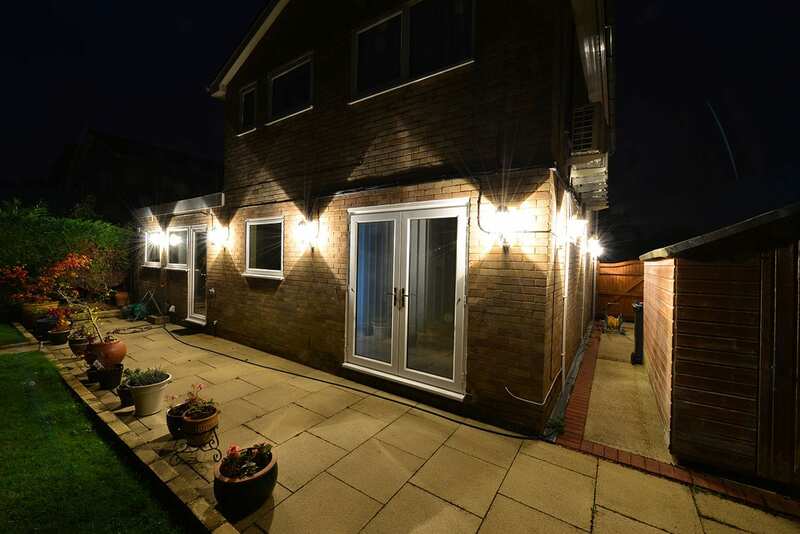 Outdoor lighting can allow your house and surrounding property to shine (excuse the pun) even when darkness falls. Another common concern with outdoor lighting is security. A dark house is an open invitation to criminals. We all know the importance of making sure a house looks occupied. There’s the old porchlight and light in the window method of signifying your presence. But keeping your property adequately lighted is another important defense against unwanted visitors. Lighting up the areas around your home where people walk is also an important safety consideration. Stumbling around in the dark is neither safe nor desirable. One benefit of outdoor lighting that is sometimes overlooked is that it lets you use your outdoor spaces at night. If you enjoy spending time outdoors during the day, there’s no reason for the fun to stop when the sun goes down. Especially with Georgia’s warm summer night, nighttime can be a great time to be outdoors. Lighting decks, porches, and patios creates extra space to host friends or just spend time outdoors. Lighting swimming pools, gardens, gazebos, and other features also gives you access to parts of your property that would otherwise disappear into the night. The first type of outdoor lighting most homeowners install is path lighting. In its most basic form, path lighting allows residents and visitors to safely follow a path to your front door. Many homeowners will make the mistake of installing free-standing solar-powered lights. While these may provide some light, they are usually poorly built and offer much less light than a wired system. If you choose to work with professional installers like the experts at Night Vision Outdoor Lighting, they can help you. We’ll make sure that your path lighting is beautiful and functional, and we only use the highest quality lights and fixtures. When people think of outdoor lighting, many of them are thinking of the sort of lighting that illuminates your house at night. Lighting your home increases security and lets your beautiful home shine in a whole new way at night. Night Vision will use a combination of lighting types to light up the facade of your home and focus on particular features. The other most common type of outdoor lighting homeowners seek it landscape lighting. Just like you want your home’s beauty to carry on into the night, you want your landscape to show at night. Night Vision Outdoor Lighting can mix and match a wide variety of lighting styles to get just the right look for your property. We’ll work with you to identify areas you want to highlight as well as suggesting some ideal lighting areas. Our technicians can help you light up favorite trees, hardscapes, water features, benches, gazebos, and many other features and structures. The goal is always to give you the most beautiful landscape at night. When it comes to lighting up your house, a typical installation uses a mixture of lighting types. The overall goal is to make your home stand out at night. Lighting should show off your home and highlight unique or beautiful features of your house. The main light on your home will come from wash lights placed at the base of your home. These wide-angle lights will provide a gentle light over the whole facade of your home. It is usually best to use a soft white type light for the entire facade of your home. The light is warm and inviting, giving an inviting glow to your home without being overpowering. These lights will usually be in the 3000K range on the light temperature scale. In addition to the wash lights, it is very common to use strategically place bullet lights to highlight individual features of the home. Narrow-angle bullet lights can be used as uplighting to illuminate unique architectural features, such as dormers or other distinctive characteristics of a home. You may also want to light columns and other large structural features. Additional lights may be used for downlighting. The goal is to highlight the areas of your home you want to show off without causing too much contrast. While lighting can draw out or create new visual effects with light and shadow, you want to avoid overdoing it on your house. To light your landscape, you will need to identify what features and areas you want to highlight. Typically, lighting should not overlook unique or special trees, water features, garden structures, statues or sculptures, or other garden features that would stand out during the day. In addition, path lighting can guide visitors through a garden while also shining a light on favored flower beds, ornamental bushes, or other low to the ground features. When it comes to lighting trees, there are numerous options. One common method is to use a combination of bullet lights to light the tree from an angle. The goal is to avoid harsh shadows and illuminate the tree’s trunk. For exceptionally tall trees, more lights may be required. For water features and hardscapes, such as stone walls, you can get more creative. Lighting can create new textures and shapes out of light and shadow that may not be apparent during the day. For water features, some people even choose colored lighting for a little extra flair. For flower beds and features lower to the ground you can install garden lights. These are usually short lamp-like fixtures, the same as used for path lighting. They can create wonderful little pools of light to show off your favorite flowers, bushes, and garden gnomes! Path lights bridge the gap between landscape lighting and house lighting. Good path lighting should not just illuminate your path, it should define your path. It can be used in combination with garden lighting, as well. If you have a path through a garden area, let the lights draw you from feature to feature along your path. In any case, path lighting needs to be bright enough to do its job of keeping pedestrians safe on their walk from place to place. Often this is just the walk from the street or driveway to the front door. Other times you want to safely guide visitors through your garden. Similar types of lighting are step lighting and rail lighting. If you have a porch, deck, or any kinds of steps, it is vital that you illuminate the steps and rails. This is for the basic safety of anyone walking in the area. Step and rail lighting can be subtle and pointed completely toward the ground with no upwards glare. But it must be bright enough to avoid trips or falls. As with many things in life, good path lighting is the result of experience and planning. It is possible for an ambitious do-it-yourselfer to install some lights. But if you want your house to look its best, there is no substitute for professionals. The experts at Night Vision Lighting have completed thousands of unique projects. We’ll work with you to design the perfect lighting arrangement for your needs, budget, and style. Don’t hesitate to contact us. We’ll give you a free estimate. As our many satisfied customers will tell you, Night Vision Outdoor Lighting is the best outdoor lighting in the Atlanta Metro Area.